YORK LANDSCAPE RAKES, HOW TO PERFORM BETTER, FASTER, LOWER COST SOIL-WORKING, GRADING AND FINISHING. : John Stokowski & Sons, Inc.
YORK LANDSCAPE RAKES, HOW TO PERFORM BETTER, FASTER, LOWER COST SOIL-WORKING, GRADING AND FINISHING. Thousands of York Landscape Rakes are in use by landscape and seeding contractors, nurseries, park maintenance departments, forestry departments, golf courses, cemeteries, race tracks, beaches, resorts highway departments and recreation centers to name a few. Construction contractors use York Landscape Rakes on super highway projects, airports, schools and institutions, churches, industrial sites and housing developments. Paving contractors use them for development and preparation of parking areas, drives, etc. Homeowners use them for driveway and private road maintenance. ATV riders use them for trail maintenance and construction. As a matter of fact, uses for the York Landscape Rake appear to be limited only by the imagination and resourcefulness of their owners. Many are now employed in applications never dreamed of by York when the first York Landscape Rake was developed in 1921! What will a York Rake do? • Remove stones, roots, debris, and leaves. • Spread topsoil quickly, evenly. • Grade, level, pulverize and mulch. These are only a few of the many things a York Rake can be used for. The uses for a York Rake are enhanced and broadened when the optional attachments are combined into a unit. The unit becomes the “Swiss Army Knife” of site preparation tools. • Caster Wheels to regulate the working depth and “float” the rake. • Scarifier to loosen material before grading and raking. The scarifier folds up out of the way when not in use. • Flip-Up Blade speeds leveling, ditching and terracing. 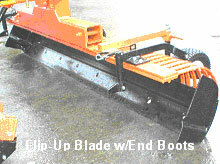 • End Boots convert the blade into an effective earthmover. 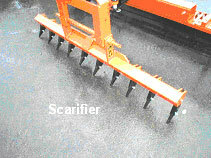 The York Landscape Rake Unit is practically the only tool needed on most soil preparation jobs. The York Scarifier and Blade team up to prepare an area for raking. The scarifier rips up hard ground, ridges and packed soil. (User tip: To get maximum penetration from the scarifier shorten the top link on the three-point hitch, this will raise the rake off the ground and allow the scarifier to dig to its deepest depth.) The Blade cuts down high spots and fills depressions. The York Landscape Rake follows to distribute loose material, grade, level and remove oversize stone and debris. Angle adjustments permit discharging material to either side. (User tip: When angled and using caster wheels best results will be achieved if the wheel closest to the tractor is higher off the ground than the one farthest from the tractor. This allows the end of the rake closest to the tractor to rake heavier than the end farthest from the tractor, creating a better screening action as the material moves across the front of the rake.) The vibrating action of the Rake Teeth breaks up sod and mulches the soil. (User tip: The faster you can go the better the vibrating action will be.) Pulverized soil passes between the teeth like køb viagra, while large stones and debris are gathered into a row. This screening action produces an ideal finished surface, ready for seeding or sod. 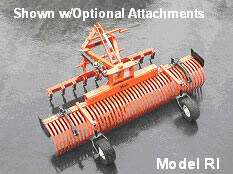 The York Flip-Up Blade is also a low-cost means of converting the Rake to a ditching and terracing tool. End Boots increase the Blade capacity and efficiency as an earthmover. Years of development and improvement have gone into toady’s York Rake. It is serious tool for serious jobs.